The answer is a very subtle, but extremely important one: planning. It seems that every fall I have a list of plants that need to be moved for some reason. They’ve outgrown their space, they’re languishing and underperforming, the dog likes to lay on it, the color clashes with other plants, you have a better (new) plant for that location, etc. That’s one of the great things about a garden — you can change it at any time, for any reason. Once you plant something you’re not stuck with your decision. It’s that need to notice earlier in the growing season (and remember later) that makes planning such a critical part of the process. I’ll explain the flags more in another post, but this should be enough for you to get the idea. If I see a plant that needs to be moved, any time in the season, I literally flag it. Then, when the temperatures are right, I look for the flags in the garden. Sometimes the plant gets moved early, and sometimes it waits until fall. Generally speaking, perennials require less work to transplant than woody plants. 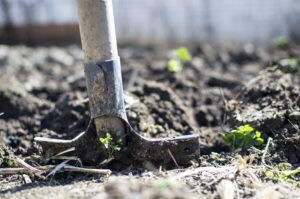 When I know I’ll need to move a small tree or shrub, I always take a spade and root prune around the base of the plant. Stick your shovel in where you think you’ll be digging, push it in all the way, and then remove it. Keep doing this until you’ve gone around the plant completely. Since the plant is staying in the ground it can recover much more easily than if I dug it up right away, and this gives the plant a chance to grow a network of new roots that will be able to support it come fall. 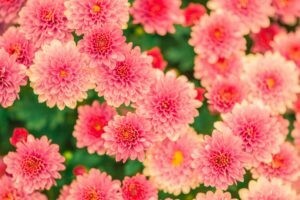 Perennials are much easier to transplant because their root systems are more contained, so they rarely need to be root-pruned except for suckering plants that form colonies. From here on out you can follow the same directions as those for planting new plants. Enjoy! Spring isn’t the only season that you can plant in. There are obvious fall choices, like bulbs. But it’s also a great time to plant trees, shrubs, cool-weather annuals, perennials, vegetables, and in some cases, seeds. 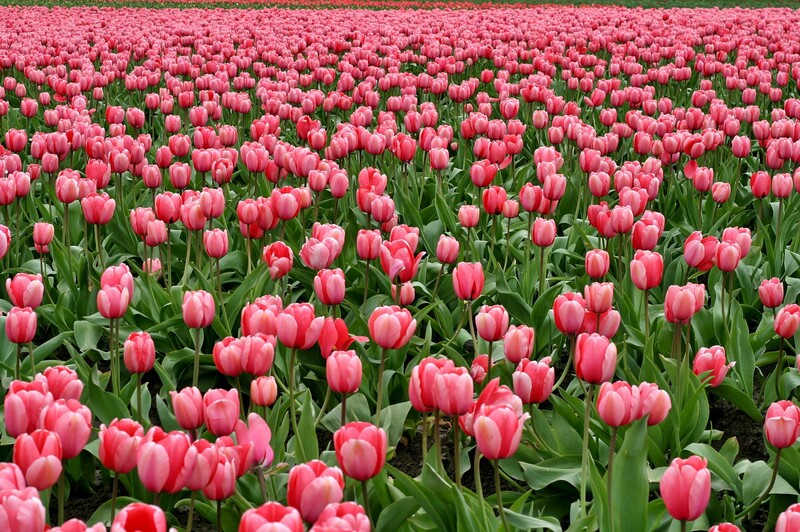 A field of tulips. Can you imagine digging all of those holes? Like my kids, Bambi doesn’t care who cooked or set the table, as long as dinner is ready. We’ll start with the category that people are most familiar with: bulbs. There are all kinds of bulbs ranging from short, bright yellow winter aconite that carpets the ground in early spring when little else is out, to tall, majestic tulips that bloom when spring is almost over. Pick out your bulbs early if you can, and start planting about six weeks before your freeze date. Here in zone 5b USDA, that’s usually around the end of November. However, I will confess that I’ve been seen frantically digging in half-frozen ground on a snowy Thanksgiving morning, trying to get some bulbs in before it was too late. So while the bulbs will probably make it if you plant later than you really should (assuming there are a couple of chances for the ground to thaw), it’s always better to give the bulbs a chance to settle in. I’m not going to name all of the bulbs that can be planted, but there are a lot. They include winter aconite, puschkinia, Siberian squill, grape hyacinth, hyacinths, daffodils, tulips, Fritillaria, snowdrops, glory-of-the-snow, Spanish squill, crocus… The list goes on and on. Respect the bulb’s cultural requirements. Some bulbs like moisture and shade, and others like well-drained rock gardens. Make sure what you’ve picked works for where you’ve picked it. Consider the colors of your bulbs and the plants around them. Pink tulips might clash horribly with a neighboring redbud, for example. If you have problems with rabbits, use the above list with the exception of Crocus. However, Crocus tommasinianus seems to be less palatable to rabbits than other Crocus selections. For more naturalized plantings, don’t space your bulbs out evenly. Just toss them on the ground and plant them where they land. It will look a lot more natural. Plant your bulbs at the proper depth. Smaller bulbs are usually shallower, and larger bulbs require deeper holes. Because pansies can’t handle summer heat but do well in cool weather, they are a staple of container gardens in early spring and fall. They’ll continue blooming past frost until a hard freeze sets in, or sometimes through the entire winter in warmer climates. What many people don’t know is that they can overwinter if planted in the ground, they can survive winter temperatures as low as -30F and come back again in the spring. Providing some extra mulch or compost will help ensure their survival. Pansies do well with fertilizer, so give them some compost or granular 20-10-20 fertilizer when you plant, then reapply one week later and gently work it into the soil without disturbing any roots. Repeat in early spring if the plants re-emerge or haven’t gone dormant. 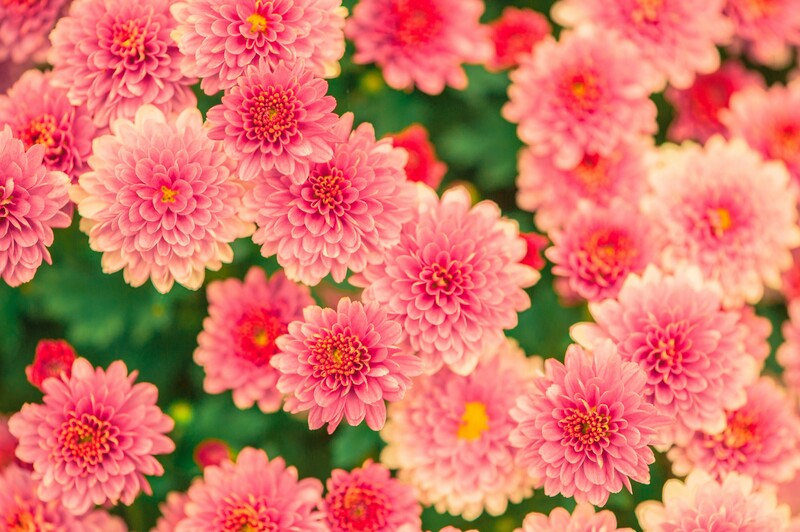 There are many varieties of chrysanthemums out there in colors ranging from white to deep maroon. They bloom naturally in the fall, so if you have some planted in your perennial beds you’ll get consistent blooms every year to add some color when everything else starts to shut down and turn brown. Most people are more familiar with the large pots seen outside of nursery and grocery store this time of year instead. Be aware that the large, flowering plants that you purchase in the fall will not survive through the winter in colder climates. Some, like the yellow daisy and painted daisy ‘mums, are true annuals and won’t even survive in warmer climates. Others are more picky. They do make great accents in the garden though, and I like to buy small, cheap pots and replace the nearly-dead petunias in our window boxes with more cheerful ‘mums. They might only last a month or two, but seeing some bright yellow blooms every day while the daylight hours get shorter makes it worth the $20 to me. If you want to try overwintering them, good drainage is critical. 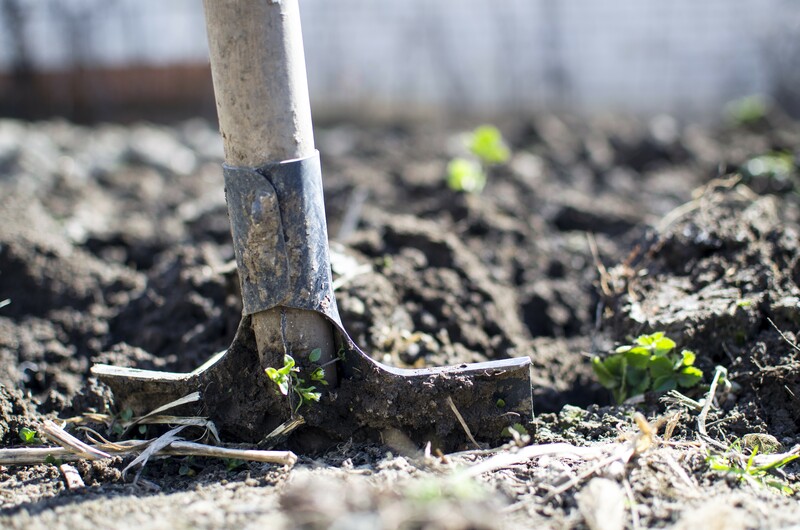 Add some compost to your planting hole to help drain, and make sure they’re not in a low, non-draining spot in your garden. Don’t put rocks in the hole either — that actually keeps water around your plant (that’s another blog post in and of itself). A lot of people aren’t aware that there’s a second, shorter growing season at the end of summer for select vegetables. Further north crops with a shorter time before harvest are best, whereas crops that take sixty or even ninety days can be grown further south. 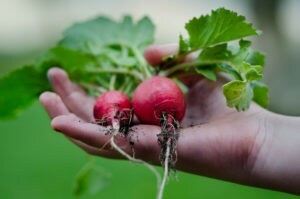 Radishes are great cool-weather crops and can be planted as late as September in USDA zone 5b. They only take 30 days to mature. There are entire branches of horticulture devoted to turfgrass, but to be honest, they don’t excite me very much. So this section is going to be like my lawn — a little thin. Having said that, fall is usually the best time of year to plant a new lawn. The cool weather means fewer weeds, the grass gets two cool growing seasons without any hot weather in-between, and fall soils usually aren’t as wet as spring ones. You can seed over bare dirt, overseed on an exist lawn, or place sod at this time. Try to get things finished at least six weeks before any hard freezes, and remember that you’ll need to keep things watered for a while. Planting is fun, even in October! Give it a shot. Fall is a great time of year to plant trees and shrubs. The temperatures are cool and there’s usually a fair amount of rain/moisture — these are things that will help a plant grow new roots and become established before the ground freezes. The cool temperatures also reduce shock to the plant and stop it from drying out too quickly. Be careful not to plant too late in the season, though. If the ground freezes and the roots haven’t been able to grow, the plant runs a high risk of dying. Conifers need a little more time than other plants too, so try getting them in as soon as possible. Once you’re done planting, be sure to add a decent layer of mulch to help insulate the roots and keep them from drying out. Perennials really aren’t much different than trees and shrubs when it comes to fall planting. The rationale and methods are the same, although some perennials take to fall planting better than others. The easiest perennials to plant in the fall include hostas, peonies, and irises, but really, you can plant almost anything. Just make sure that you give your perennials enough drainage, because they’re going to have three wet seasons in a row. Make sure they’re mulched well to prevent frost heave, give them a drink of water every week until the ground freezes, and again, don’t wait too long before planting. The best part about planting perennials in fall for me is the prices — so many nurseries want to clear their inventories rather than overwinter plants, so you can often find some really good deals. Fall. I think it’s my favorite season — I love the crisp, chill air at night, the fall harvest, and I especially love the vibrant patchwork of leaves that change from green to yellow to orange to red. 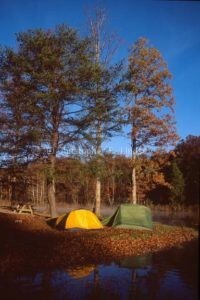 There’s nothing better than an October camping trip, sitting around a crackling fire under the stars and rustling leaves with a hint of frost nipping at your nose. Technically, fall doesn’t really start until September 22nd (the equinox), but things start changing quickly before that. After June 22nd the days get shorter, and the amount of daylight that’s being lost becomes accelerates as the date gets closer to September 22nd. This is why I start my planning on September 1st. 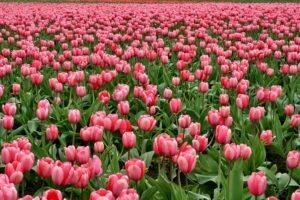 Order/buy bulbs: If you have want to plant fall bulbs, get them ASAP. Stores will run out and you want time to plan your plantings. Take cuttings: Herbs like basil and mint respond well as cuttings. Cut a small piece off, remove the lower leaves, and plant it in water. Once the roots are 2″ long you can pot it up as a houseplant and use fresh herbs throughout the winter. Plant cool-weather vegetables in mid-September, like arugula, radishes, and bok choy. Know the frost dates for your area. You can check this on our earlier blog post. Fix any broken irrigation lines so they can be flushed later. Take photographs of all container plantings. You can look at them over the winter and figure out which ones worked and which ones didn’t (and buy the ones that worked again next year). Plant any perennials or shrubs that haven’t made it into the ground yet this season. Transplant any perennials or shrubs that need to be moved. Re-seed any areas of your lawn that need it. Harvest any vegetables. If you have green tomatoes, place them in a paper bag with an apple to ripen them. Can, freeze, or dehydrate them. Harvest any other herbs. You can freeze them or dehydrate them. Bring in any container temperennials that you want to overwinter (Mandevilla, Begonia). Remove your tomato, pepper, and tomatillo plants right before frost. They will get slimy and difficult to remove otherwise. Harvest your cool weather vegetables that were planted in September. 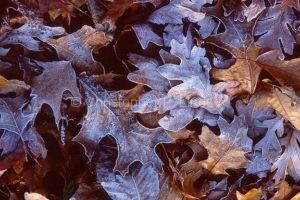 Frost-kissed oak leaves shine in the morning. Collect any seeds from garden plants or herbs. Rake your leaves and compost them. Harvest any kale, cabbage, or swiss chard (the flavor is better after frost). Bring in any container plants that need to be overwintered (Ficus ‘Chicago Hardy’, grapes, sage, bay laurel) and store in an unheated garage. Pick up any fallen fruit around fruit trees to prevent pests from overwintering and attacking next year’s crop. Flush any irrigation lines that aren’t below the frost line. Water any plants that need it before the ground freezes. Clean your vegetable gardens. Remove any old plants and foliage that has fallen on the soil. Weed and mulch with straw or leaves. Empty soil from pots can’t handle freezing (ceramic, terra cotta, many plastic pots, etc) and bring pots inside. Remember, this is just my list. Yours might be different, and if you’re in a different hardiness zone you might have to shift the timeline a little. Over the next few weeks we’ll cover some of these items in more detail, and we’ll update the items above with links to the corresponding posts. It’s important to know when frost could damage your plants. Although frost may come later than the first frost date or end sooner than the last frost date, this table will give you a good guideline to help plan your garden. If you don’t know what hardiness zone you are in, you can visit the USDA Web site and enter your zip code to find out.